This is the first lesson plan in our series titled, “Toddlers Knowing God.” Each of these studies help children age 18-24 months better understand the character & nature of God. Click here to see the main index for these Bible lessons. This particular lesson is based on Psalm 23 and John 10. In very simple language, it shows how God is like a shepherd that cares for us. You Can Help: We love to read your ideas to make the lesson plan better. Click here leave a comment. Main Idea: God is our good Shepherd. We are His sheep. He takes care of us. The following activities are designed to reinforce the simple Scripture truth, encourage their development, and engage their imaginations and creativity. Choose the ones that will work best for your classroom. ASK: What does a sheep say? (Baaaa.) God is our Shepherd. We are His sheep. He takes care of us. I will pretend to be your shepherd. You are my sheep. Follow me, and I will care for you. DO: Have another teacher get on the ground and act like a sheep to encourage the toddlers to do the same. Lead your sheep to water. Encourage them to drink. Lead them to food. Encourage them to eat. SAY: All of my sheep are here. I am a shepherd and I protect my sheep. God is our good Shepherd. He protects us. If they have trouble following you during this activity (straying from the other children), SAY: Sheep follow their shepherd! I need (child’s name) to follow me! God is your good Shepherd. 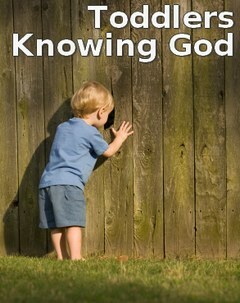 He knows your name and calls you to follow Him! SAY: Here is a sheep for you to take care of. Can you tuck them in and keep them safe? The Bible says God is our good Shepherd. We are His sheep. He takes care of us. DO: Show them how they can pull the boxes behind them and lead their sheep. Repeat the main idea as much as you can. SUPPLIES: Medium or large box/container, cotton balls, small Bible, toy sheep, toy shepherd, small books about sheep, or any other small items that might go along with the lesson theme. Fill your box with cotton balls. Hide the items throughout. Bring real wool to class. Let them touch it and describe the texture. Repeat the main idea as they touch the wool. If this is an option for you, bring a real sheep/lamb to your church. Let your toddlers pet the sheep. Talk to them about what sheep are like (behavior, eating, etc.). Repeat the main idea as they are discovering new things about sheep. Print out various pictures of sheep and shepherds. Put them in random places around your room where your toddlers will be playing. When they are in that area, talk to them about the pictures. Ask them what they see. Repeat the main idea. SUPPLIES: String, small, square pictures of sheep/shepherds, small sheep/shepherd toys/figurines or puzzle pieces, anything small you can tie or tape to a string. This activity works well if your classroom has a table. Tape the string to the table, close enough to the chairs so a toddler could pull it up. Make it long enough so it dangles close to the ground on the other side. Tie/tape your items to that end. Have your toddlers sit opposite of the items. Show them how they can pull up on the string and discover fun things! Repeat the main idea as they play. There are many children’s book based on Psalm 23. Read them a picture book like this. Or you could read a story about David when he was a shepherd or Jesus’ lesson about being the Good Shepherd in John 10. Or if these are unavailable to you, make your own little picture book based on Psalm 23 or John 10! Hold hands or bow your heads together (just demonstrate and ask them to do the same. Some may, most may just watch.) Say a short prayer like the following: Dear God, you are our good Shepherd. We are your sheep. You take care of us. Help us to follow you. We love you. Thank you for loving us. Amen. These lessons and ideas are great! Thank you so much! I have the toddler youth class and I was blank on how I was going to teach 2yrs old about Jesus where they can understand and obtain the information. I was feeling discourage and these lessons have made me sooooo excited!!! Thanks a bunch!!! I was asked to bring a bible class to 1-2 year olds, at a day care, was clueless on how to do this. then I found these wonderful lessons. Praise God. Thank you so much it helps make this enjoyable time for all. Hope you will post more. Looking for a school year of lessons. Thanks again. Thank you so much for these. I am taking care of the 2 year olds in my Sunday school and I just stumbled on these amazingly simplified lessons. God bless you! Thank you! Thank you! I was a k-6 grade elem teacher for 33 years. This year I was asked to teach the 1 & 2 yr olds at church. You totally conquered my fears of how to teach the Bible to these little ones and make it fun. These are wonderful lessons! We have enjoyed using them so much! Please keep writing!! Tony Kummer (Editor) reviewed & updated this page on : June 29, 2012 at 1:08 pm. All our content is peer reviewed by our readers, simply leave a comment on any post suggest an update.